end up with a better person at the end. Which raises the obvious question: why is such a move still unthinkable in the US? There are lots of big jobs coming up here: Treasury secretary, SEC chairman, Fed chairman — and all of them are going to go, automatically, to US nationals. Think about it this way: Mark Carney is the best central banker in the world, and he would be an amazing replacement for Ben Bernanke. What’s more, given the choice, he would surely plump for the Fed over the Bank of England. So it’s reasonable to assume that if the US wanted him, they could have had him. Felix is, I think, more or less a proponent of a borderless world, which makes him a bit of an outlier on things like this. Still, it’s a good question. Why not hire a foreigner to run the Fed? First things first: would it even be legal? As it happens, many federal government agencies aren’t open to noncitizens, and the annual appropriations act generally prohibits the use of appropriated funds to pay noncitizens. If we were talking about, say, HUD or the Department of Education, a foreigner would probably be out of luck. Luckily for us, the Fed allows employment of foreign nationals with the appropriate work authorization, and presumably that wouldn’t be too hard to get. So yes: it would be legal. But would it be a good idea? I’m more of a nationalist than Felix, and I’m not sure it would be. This is not, after all, just another cog in the civil service bureaucracy. I’d want my president to be a U.S. citizen, for example, because I’d want to be damn sure that the president has the best interests of the United States firmly at heart. Ditto for members of Congress. And ditto again for the most senior, policymaking positions in the federal government. That decidedly includes the Fed chairman. Beyond that, I’m not really convinced there’s any such thing as “the best central banker in the world” anyway. If your problem is that you don’t like Ben Bernanke’s policy preferences, then you’ve got a problem with Barack Obama, not Bernanke. There are probably plenty of qualified Americans who share your taste in monetary policy, whatever it happens to be, but apparently Obama didn’t want to appoint any of them. Likewise, if your problem is that you think America’s regulatory apparatus is too friendly to Wall Street, then you should blame Congress and the past few presidents. They’re the ones who deregulated the financial industry and continually reappointed as Fed chairman a guy who was eager to implement this deregulation. Finally, if your problem is that Bernanke hasn’t been able to persuade the FOMC to adopt looser monetary policy, what are the odds that a Canadian technocrat would have been any better at it? Slim and none, I’d guess. I don’t doubt that Mark Carney is a terrific central banker. 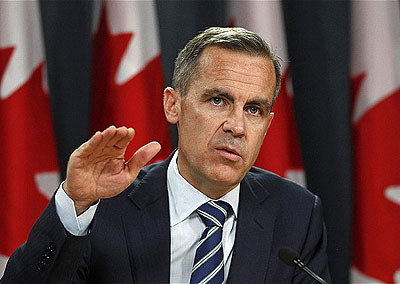 But technical competence isn’t that hard to find, and Carney had the advantage of working in a country with a long history of conservative financial regulation. That probably had more to do with Canada’s strong performance during the financial crisis than Carney’s response to the crisis did. After all, Ben Bernanke provided mountains of liquidity to the financial system, just like Carney, and dropped interest rates to near zero before Carney did. Long story short, the main difference between the U.S. and Canada seems to lie in their respective regulatory regimes before the crisis hit, not the response of their central bankers after the crisis hit. So there’s probably not much point in looking overseas for a Fed chairman. We have plenty of good candidates on offer right here at home. What we really need is a better regulatory regime and a different national attitude toward monetary policy. This is a political problem, not really a central banking problem per se, and the solution isn’t a better Fed chairman, it’s a political class that wants a better Fed chairman in the first place. Horse, meet cart.